Need a stylish promotional item to expose your brand name with a choice of four colours? We have the perfect business gift for your customers this winter. Our new Promotional Hat Scarf Set is ideal as a promotional freebie or business gift to those special clients and customers - Why not treat them to something really special this year that they can add this to their wardrobe set and treasure as a favourite winter gift. With a choice of four colours you can ensure a custom finish and a personalised embroidered finish to really show off your brand name and company logo. 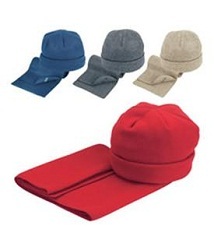 Our Promotional Hat Scarf Set set is a classic, hat and scarf set made of quality fleece. Keep warm and cosy with this fleece scarf and hat set to keep the head, neck and ears warm, or tuck it into your coat or jacket this winter. As the perfect good-will gesture this winter, add a sparkle to an advertising promotional gift and ensure business with customers and clients in the future. For a FREE QUOTE please fill in our contact form regarding our Promotional Hat Scarf Set and we'll be able to help you.